New York Subway Map with New Jersey transit systems, including Hudson-Bergen Light Rail, NY Waterway ferry, & PATH, by Stewart Mader. Hudson-Bergen Light Rail – New Jersey: solid yellow lines. Operates 5AM-11PM. New York City Subway – New York: lines in multiple colors. Operates 24/7. New York Waterway Ferries – New York & New Jersey: light blue dotted lines. Operates 6AM-11PM. Port Authority Trans-Hudson (PATH) – New York & New Jersey: bright blue lines. Operates 24/7. Staten Island Ferry – New York: light blue dotted line. Operates 24/7. Staten Island Railway New York (inset): solid, navy blue lines. Operates 24/7. 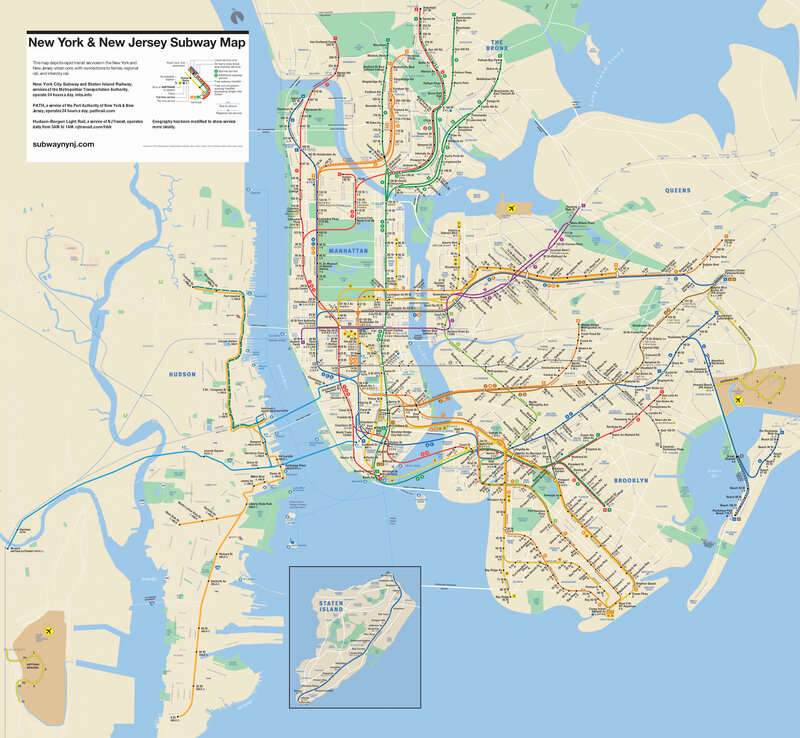 The New York & New Jersey Subway Map is a comprehensive transit map for the largest US metro area. It depicts all transit options, similar to maps in other global, peer cities, like Berlin, London, Philadelphia, and Tokyo. It is based on the design of the official New York City Subway Map that influences the transit choices of over 2.4 billion annual riders. Stewart Mader brings new thinking and nearly two decades of experience in design, digital strategy, and communications to his work transforming transit. He established the PATH Riders Council, built a new model for constructive collaboration with the Port Authority of NY & NJ, and created the New York & New Jersey Subway Map used by tens of thousands of riders to seamlessly navigate the entire metro area. He advises agencies, officials, and policymakers based on his proven ability to lead complex projects and deliver results in demanding corporate and public-sector venues. He writes and speaks about transit, and he is building Transit Standards to make transit as easy as driving. Traveling between New York & New Jersey? Download the official RidePATH app. Available for iOS & Android.